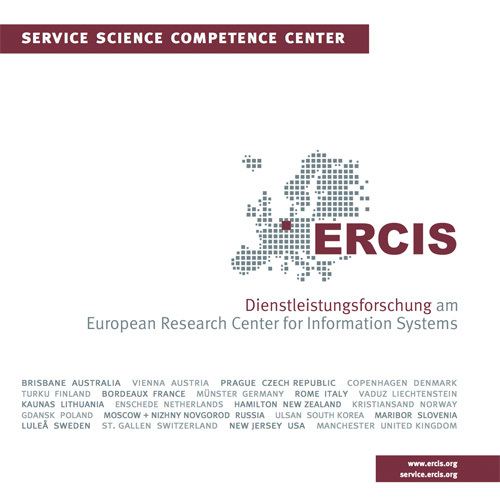 FOKUS:SE - Researcher Network Service Engineering | ERCIS Competence Center "Service Science"
FOKUS:SE facilitates the exchange and coordination of research activities - mainly for junior scientists (Ph.D. candidates, Post-Docs and junior professors). FOKUS:SE aims for the connection and further development of existing research activities in service engineering and the reinforcement of the scientific community. FOKUS:SE brings together its members and national and international business experts in meetings twice a year. ERCIS members Sebastian Bräuer, Daniel Beverungen, Friedrich Chasin, Jan Betzing, and Martin Matzner have joined the Research Network on Service Engineering (FOKUS:SE) that is sponsored by the German Research Foundation (DFG). More information is available at: http://fokusse.infai.org/.